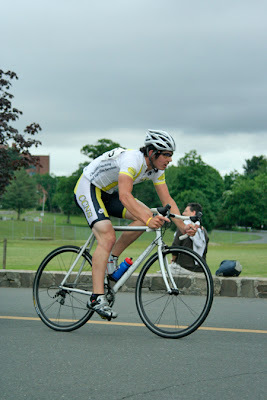 Support the CCNS/Pedal Power Cycling Team! This is the teams first season and so far the guys have been holding their own on the roads. Click on the image below to check out the new team blog. It has the latest news, info., and results of the team. I saw this quick clip of Jake Lineberry on Matt Jones' MySpace page. If you know where this spot is you know the dirt bank isn't that steep and he had to cut across 2 roads and an intersection to get the much speed! John Ludwick with some Jedi trickery! Whore Island, where anything goes! 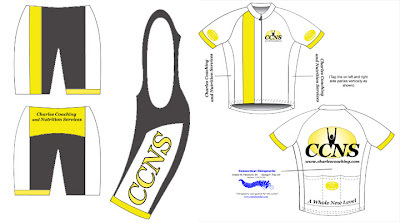 The CCNS/Pedal Power Cyling Team kits that I designed, based on Team Coach Aidan Charles' input, are now for sale. Contact me if you are interested in purchasing a kit (Includes bid shorts and full-zip jersey). That's a steal! and they are selling fast! Another order will be going in soon so act now! 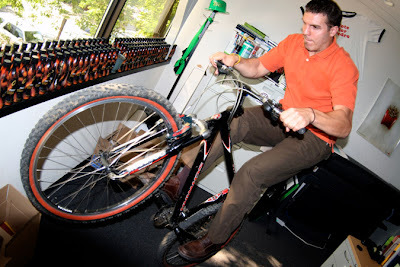 Jason brought his mountain bike into the office this morning because its suppost to rain out. Since it wasn't 9:00 yet I had time to play around a little. Pogo...in "work clothes" and loafers! ...or not! Anyway, T and I went down to have our "last supper" with Shawn and Meryll. Tomorrow is the big day, Hebrank heads to MinneCRAPolis. 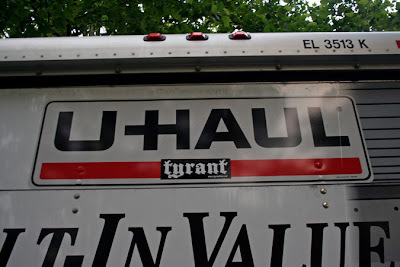 Shawn is driving a 17 foot UHAUL 2/3 the way across the country, I had to make my mark. Heck, that's free advertising! Best of luck guys. Thanks so much for everything!!! I just got the Final Cut Studio 2 for my MAC, $1,300 worth of professional video & audio editing software. To go along with that I picked up a 320 gig external hard drive. Let the TYRANT DVD creation begin! 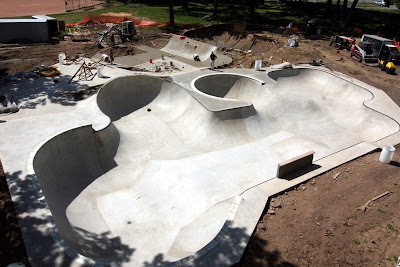 This thing is going to be legit! So today is Shawn Hebrank's last day in Connecticut. Tomorrow morning he and his wife are headed West to Minneapolis. Shawn has supported the hell out of TYRANT over the past few years I've know him and I totally appreciate that! I could never repay him for the countless sketches, pieces or artwork and tattoos he's done for me over the years! We're going to miss you dude! MinneCRAPolis doesn't know what's they've got coming! With that said, Saturday night a bunch of people got together at Rudy's in New Haven to wish Shawn and Meryll well before they leave. It was a really fun time and in true TYRANT fashion I was acting like an idiot. I know the title is lame, but "Sunday Session" has been used a half dozen times. Anyway, T and I picked up "Tiny Tyrant" and headed out to a few of his local parks in the Northwest corner of the state. The day started with a little scare when I bailed out 180ing a platic jersey barrier and hit my head pretty hard. I was wearing a helmet, but I was still knocked for a serious loop. Ouch! Brandon was shredding like usual and he is running his bike brakeless. It was a gorgeous Spring day and we had a good time riding our bikes. 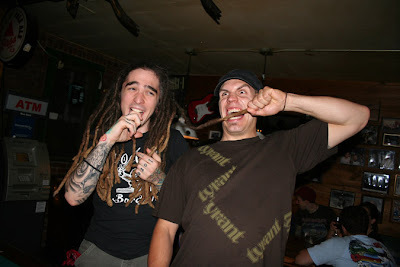 Have a look at the photos over at TYRANT's Flickr. 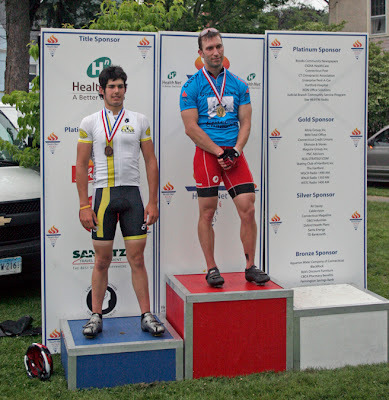 Congrats to TYRANT supporter Bob German on placing 3rd in the Nutmeg State Games Cat. 3 Criterium. For those of you who don't follow road racing, its 25 one mile laps (25 miles) of all out riding. Bob races for CCNS/ Pedal Power, the same team I raced on last year....and will race for this year when I get my a$$ in shape. What was also a amazing was that 45 minutes after riding a the 25 mile Cat. 3 race Bob raced the Open Pro Cat. 1,2,3 race, a field that was full of big name pro riders. It was great to see Bob hang in and place in the top 30...not bad for a 17 year old kid in his 2nd year of road racing! Yeah, I caught wind that BIKES WILL NOT BE ALLOWED at the amazing Stamford Park I've been posting photos of. Total BS if you ask me! I'm not too concerned! 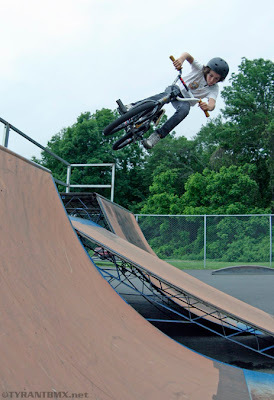 It is going to be another Groton...early AM BMX sessions before the wood pushers come. Cody Caron is selling his BMX bike! It's worth over $1,000, but he's asking $600. Contact me for details! Other Modifications/Extras: cut down front axels, titanium spindle. Frame: Eastern reaper 21tt span bb "no holes in the tubing"
Stamford is coming along super nice!!! 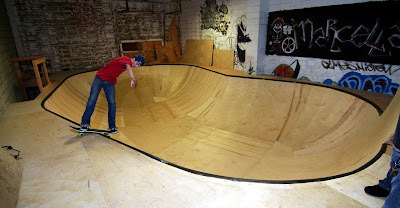 The new bowl at Eastern Pulse looks pretty fun! Photos stolen from Concrete Disciples Thanks!